Systemic Lupus Erythematous (SLE) is a chronic, multi system disease involving connective tissue that appears to result from production of autoantibodies. Immune complexes and other immune system constituents combine to form complement that is deposited in organs, causing inflammation and tissue necrosis. The disease may be mistaken for rheumatoid arthritis, especially in early course of the disease. Course of the disease is highly variable, but complications of SLE include infection, renal failure, permanent neurologic impairment, and death. 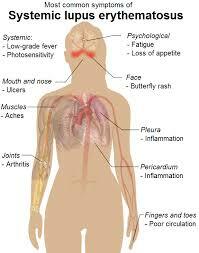 The disease is more common on women than men, usually women at childbearing age, but can affect children age 5 to 15.